Charcoal and chalk on toned brown paper. 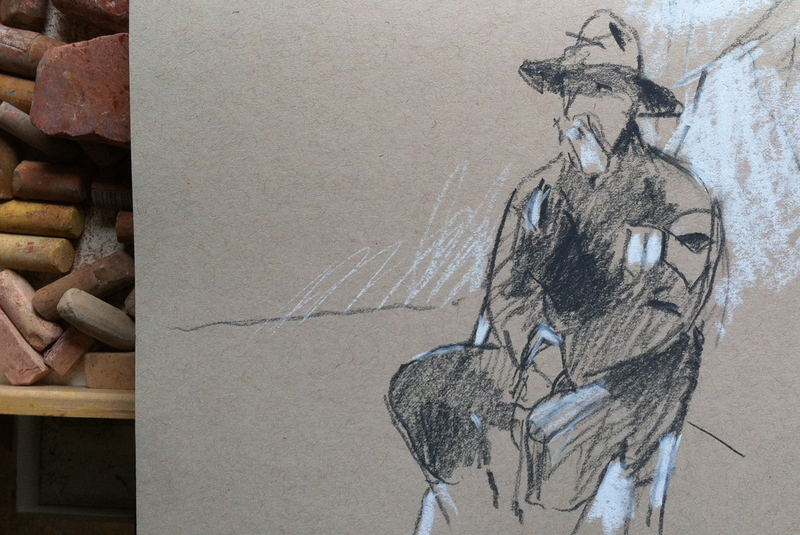 This is a life sketch I rendered last weekend at a battle reenactment. The opportunity to draw the figure from life is rare for me, and Civil War reenactments are a grand time, with costumed participants, equipment and regalia for subject-matter. Beautiful, relaxed and loose feel. How long (in minutes) was this study? Looking forward to seeing more, especially anything with action done from photos. Thanks much! I noticed my quick sketching is slowing down these days. But, this was probably 5 minutes, and he was very sedentary. I did do some action sketches from life, and some can be seen if you select the Civil War tag here. I will post some from photos, later, but they will be an amalgam of memory, life and with photos as reference. Hi Casey, I think you captured an interesting gesture. It's fascinating to see how much you can capture with such loose marks. I' m particularly interested in the toned paper, it's different starting with mid tones. You use it well.